. CYP 1 to 8 HDMI UHD 4K2K Splitter 3D Support. HDCP Compliant. CYP 1 to 8 HDMI UHD 4K2K Splitter 3D Support. HDCP Compliant. The HDMI v1.4, 1 in 8 out 4K2K Splitter from Cypress Technology is a high-performance splitter that supports 4K2K, 3D, 12bit Deep Color, as well as High Definition Audio. 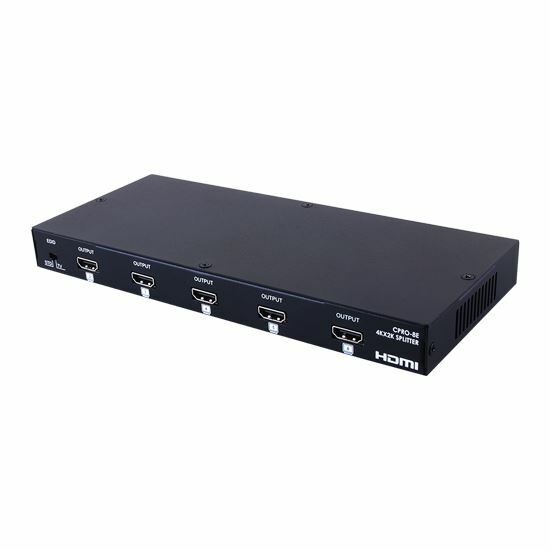 This Cypress product allows users to connect a single HDMI input source, such as a Bluray Player or PS3 and can split these signals to be displayed on up to eight HDMI displays, such as an HDTV, projector or 3DTV, with no loss in signal or quality. Furthermore, the content can be split between two, four or eight displays, and can be set to either work independently (each display the content separately) or together as a single screen. This Cypress device is versatile and useful for a number of applications, including home entertainment, lecture displays, retail promotions, commercial advertising displays, showrooms displays, business/educational presentations.